We’d love your help. Let us know what’s wrong with this preview of The Truth About Negotiations by Leigh L. Thompson. To ask other readers questions about The Truth About Negotiations, please sign up. The Truth About 53 series on negotiation. Well written negotiation books using 53 truth to manage negotiation challenges in business and other environment.To sum up, everything you need to know to enhance your negotiation skills. "You have not what you deserve, you have what you negotiate"
ZOPA: "The Zone Of Possible Agreement" , In a business negotiation, two polar-opposite errors are common: reaching agreement when it wouldn’t be w The Truth About 53 series on negotiation. ZOPA: "The Zone Of Possible Agreement" , In a business negotiation, two polar-opposite errors are common: reaching agreement when it wouldn’t be wise to do so, and walking away from a mutually beneficial outcome. How can you avoid these pitfalls? Through careful preparation that includes an analysis of the zone of possible agreement, or ZOPA in business negotiations. BANTA: "Best Alternative to a Negotiated Agreement",we sometimes reach agreement even though a significantly better deal is available to us elsewhere. Were all of the "truths" useful? Not for me. Maybe I don't get all of the final points yet, or maybe I just don't understand how to apply them. At the same time, I don't think I have read yet that is 100% a Yes, this is a quick read, but unless you have done other reading on the topic of negotiation, I think this is a great introduction to the subject. I have been able to put a number of these principles into action, and feel like I have gotten better results, so it meets the initial smell test. Easy read and great takeaways. I don't think this could be your only book on negotiation because it doesn't go into enough detail, but it is a solid companion to existing knowledge. It is a quick read on negotiations. However, I read it as part of a class. It does not go into great detail. This is a dense summary of research-based negotiation insights. This was the first book I read about negotiations. It starts off with very tactical advice about negotiating. It defines terminology such as "winner's regret" and "BATNA" that are extremely helpful to anyone who tries to buy anything in a market setting, which is practically everyone. Towards the end, it loses steam a bit when it wades into cognitive psychology -- which is relevant but it's better covered elsewhere. All in all, pretty good book. a slightly 2-hr reading on how to proceed to implement a sequential negotiation technique...very sequential as a point to maintain both's platform not to be deviated, ultimately to achieve a possible win/win scenario..other scenarios are also provided...alright to read..
Good introduction to the art of negotiations. There were times when I wanted more details on how to follow the advice, but the references proved to be a great place to go for more information. 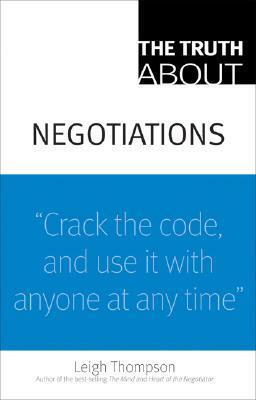 Very easy read with palatable tips to consider when negotiating. Since reading this book and taking my MBA Negotiations class, I find that I view transactions through a different lens. I look for more win-win situations and I am more willing to speak up. I read this book in its second edition. Although not entirely scientific, I think it offers pragmatic advice for negotiations and I will keep it close on my shelf for quick reference. I would recommend this book to my friends in sales and government. The -blatantly obvious- truth about negotiations. I'll spend as little time on this review as not to bore you anymore with it: Pretty useless beating around the bush for a couple hundred pages, then it goes downhill. 53 chapters go pretty quick when they're 2-3 pages each. The title is a bit presumptuous, and some of the "truths" were better than others, but overall some good advice for negotiating. Quick, easy to understand tips. Hopefully I've learned / highlighted enough useful information for upcoming classes. Great truths, some of which I learned the hard way, others very valuable and good to have in my tool box. A very decent book! Back to the basic lesson, it is a win-win solution in every situation. It always takes two to tango! This was a pretty easy read with decent takeaways, but I don't think it could be someone's sole source for information on how to negotiate. It prompts me some basic steps and tricks with negotiation. I still remember BATNA techniques and stuff. However, it did not provide a comprehensive approach into negotiation.